A two piece marble top adorns a three tier granite base that sits on concrete slab. The base is 50 inches high with the bottom tier roughly 82 inches square, the middle tier roughly 66 inches square and the top tier roughly 52 inches square. The marble section with inscriptions is 36 inches long, 17.75 inches wide and 35 inches high. On top of this the second piece which is shaped like a hip roof. It adds 16 to 20 inches to the total height. The marble shaft was reported to weigh 4,600 lbs. Plans for a monument first appeared in news reports from 1919. The foundation was completed by August 1920 with plans for a life size soldier statue, but in March 1921 the Cleveland Star reported the monument had been completed in the form of a stone slab. A planned Memorial Day unveiling never transpired; instead it was held on July 4th, 1921 as part of a large Independence Day celebration that had been sponsored by J.P.D. Withrow for many years. A crowd estimated at between 3,000 and 5,000 attended the day long events at the “Rock City” of Hollis which began at 9:45 a.m. with a concert by the Haynes Band of Cliffside at the monument. The audience then marched to the grove at Spring Park where a large platform and bandstand had been erected. J.P.D Withrow greeted the crowd and presented the monument to soldiers of the Great War. The Rev. Sankey L. Blanton who had served with the 30th Division accepted the monument on behalf of the war veterans. State Senator Solomon Gallert gave a tribute to the soldiers and Lee B. Weathers, editor of the Cleveland Star, and R. E. Price, editor of the Rutherford Sun, also made patriotic speeches. The Haynes Band and Queen’s Quartet performed between the speeches. Singing contests, a drilling contest by ex-service men and a baseball game were held during the afternoon. At one point Confederate Veterans and their wives were honored with a Rebel yell. A shooting that left one person dead upset the afternoon events. J.P.D. Withrow (1867-1926) was known as the Merchant Prince of Rutherford County because of the great success of his wholesale, retail and general merchandise businesses. A Democrat, he served as a NC State Representative and in the NC Senate. He was a member of the Knights of Pythias, a Free Mason, an Odd Fellow and a Red Man. He was postmaster for Hollis and an officer in the Farmers Alliance and was active in church and retail trade associations. He was a proponent of good roads and described as a liberal and a progressive. His success as a merchant came by charging less than the competitor and turning over his inventory quickly. This formula proved so successful that by 1904 his store drew people by the wagon load from 40 miles in each direction in a time when roads were not always good. The Hollis store, made of rock, was his second establishment. In his efforts to develop the area he built a combination school/meeting lodge for the several fraternal organizations of which he was a member and a Methodist Church both made of rock quarried from Cherry Mountain near Hollis. Other plans to expand Hollis did not come to fruition. News articles state that he had put Hollis on the map. It no longer is. News articles claim this was the first monument to honor World War soldiers erected in North Carolina. It may have been the first proposed and may have been the first completed but it was not the first dedicated. Per The Beaufort News, the Fulford-Day drinking fountain in Morehead City, NC was dedicated on May 10, 1921 which is the earliest dedication so far discovered of a World War One monument in the state. $1,500 was the estimated cost as reported by the Cleveland Star on August 20, 1920. This article stated the plan at that time included a life size statue of a soldier and made an appeal for donations. The final monument did not include the statue and later news articles stated that J.P.D. Withrow provided all the funding but made no mention of actual final costs. 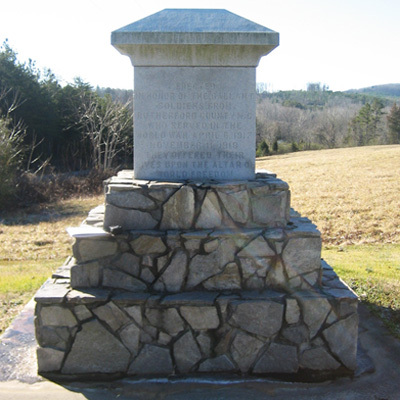 The monument can be found at 4475 Hollis Road nine miles north of Ellenborough, NC. The road is now paved and there is an occasional home with mixed farm, pasture and woodlands. The monument stands in front of what appears to be a volunteer fire department. Next to the monument is a flag pole which has a plaque at the base in memory of William H. Withrow, Cmd. USN the grandson of J.P.D Withrow. Across the street is a collection point for trash and recycling. The mercantile store for which Hollis was known is still standing a short distance from the monument but other buildings mentioned in 1904 news article are gone or in ruins including the church and school where the monument was originally located. The monument was originally located across the two lane road from where it now stands on the grounds of a school no longer extant. As first built, it had a total height of 22 feet. The original base was a somewhat crudely constructed step pyramid made of unfinished granite blocks. That base was 13.5 feet tall, 12 feet square at the bottom and 3 feet square at the top. It was relocated some time after 2002 when photographed at the original location. 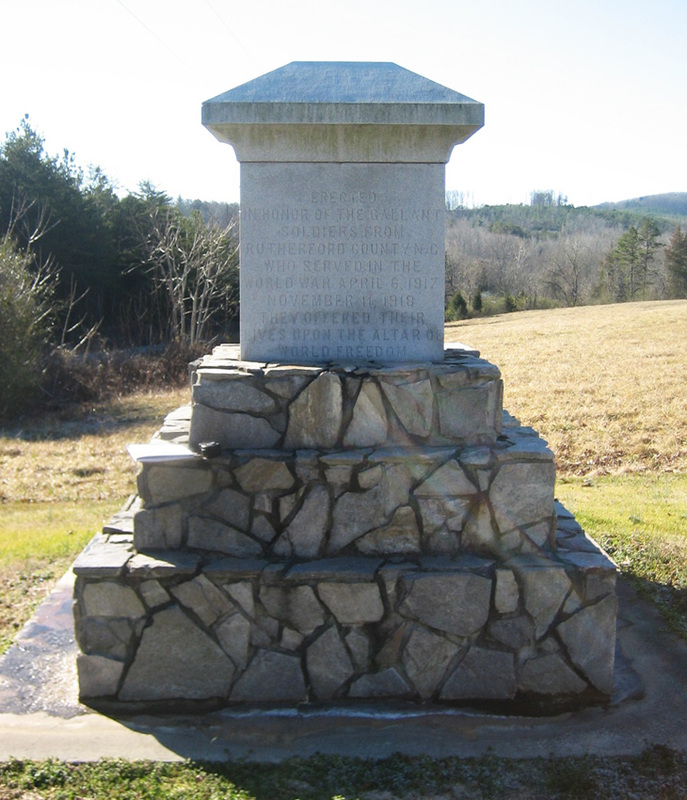 The Rutherford County inscription faced south and the Cleveland County inscription faced north.